Back in print, revised, and enlarged to bring the discussion to the present, Manis shows how two conflicting civil religions emerged in the South during the civil rights movement, each with its own understanding of America's calling and destiny as a nation. 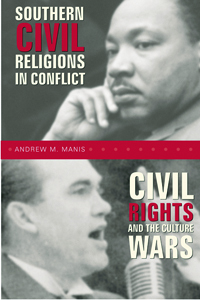 Using black and white Baptists in the South as case studies, Manis interprets the civil rights movement as a civil religious conflict between southerners with opposing understandings of America. Originally published in 1987, this new, expanded edition further argues that the civil rights movement and its opposition, with their conflicting images and hopes for America, foreshadowed the ongoing "culture wars" of recent days. In the aftermath of World War II, citizens of every region drew together to affirm their common inheritance as a people and to celebrate the nation's military and moral victories. Such triumphs seemed to confirm America as a beacon to the nations, a "city on a hill." When America and particularly the South turned inward to think about "the American dilemma" of race, the South became a battlefield of conflicting civil faiths. The growing civil rights movement, calling on the nation to "live out the true meaning of its creed," revealed within the South two separate civic creeds--one based on freedom by law and equality under God; the other finding in the Constitution a guarantee of individual rights and in the Bible a divine sanction of segregation. Manis explores the southern reaction to civil rights through the words and actions of black and white Baptists, ministers, and laypersons whose rhetoric embodied the conflicting civil religions in the South. Responding to the Supreme Court's ruling in Brown v. Board of Education, both black and white Baptists urged their fellow citizens to answer God's summons and help bring America to its God-given destiny. But as Brown gave way to the events of the civil rights movement, the segregationist dream of the Southland remaining "white man's country" was increasingly challenged as African Americans began, more militantly and more successfully, to claim the historic promise of the nation. Tracing the civil religious implications of the 1950s, Manis shows that as the civil rights movement divided Americans, desegregation became a crucial symbol for Americans who saw the nation as a land of equality and inclusion, as well as for Americans who continue to view America as properly and predominantly white and Protestant. In two new chapters, Manis connects this earlier conflict over civil religion and civil rights with what sociologist James D. Hunter called the "culture wars." In contrast to Hunter and others who have commented on it, Manis views the culture wars as centrally about the problem of race and difference in American life. What has broadened into partisan conflict about social issues such as prayer in schools, abortion, and family values, began as and largely remains at heart the question first raised by the civil rights debate: How racially diverse should America be?